What RON are you putting into your car? Are you sure about that? The problem with modern road fuels (high octane and lead free) is they deteriorate at much faster rates than lead and other older type of fuels. All fuels suffer from the problem but the biggest losers are reformulated gasolines (RFG) that contain oxygenate additives, derivatives of methyl alcohol and ethyl alcohol. Storage is the major problem for all fuels. The problem of oxygenating fuel actually increases the rate at which it degrades. Higher octane fuels actually deteriorate quicker than lower grade fuels, initially. If you really want to know why you will need to look up biokinetics and chemistry. In effect you need to leave a breather for fuel and the very breather itself allows the additional oxygen to escape. The more oxygen the quicker it will escape. Over time the fuel becomes quite harmful to the car due to the very low octane levels (but this takes a while). 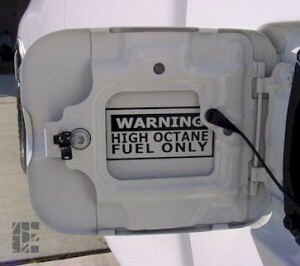 General independent estimates are that the ON (octane number) falls about 1 octane per day initially for high octane fuels where the fuel is allowed to breathe and then tapering off (so it’s not a linear degradation). Even though petrol stations store fuel efficiently it still needs to breath and modem car tanks have breathers. If you want to buy high octane fuel make sure you go somewhere that sells a lot of it from a small tank and has regular to ups. Why not ask when the last fuel delivery was? You can always drive off without putting any in if you’re not happy with the answer. You wont be the only person who has done this! Octane rating is a measure of detonation resistance, not deflagration characteristics. It might seem odd that fuels with higher octane ratings explode less easily, yet are popularly thought of as more powerful. The misunderstanding is caused by confusing the ability of the fuel to resist comprecision detonation as opposed to the ability of the fuel to burn (combustion). However, premium grades of petrol often contain more energy per litre due to the composition of the fuel as well as increased octane. There is another type of octane rating, called Motor Octane Number (MON) or the aviation lean octane rating, which is a better measure of how the fuel behaves when under load. MON testing uses a similar test engine to that used in RON testing, but with a preheated fuel mixture, a higher engine speed, and variable ignition timing to further stress the fuel’s knock resistance. Depending on composition of the fuel, the MON of petrol will be about 8 to 10 points lower than the RON. Normally fuel specifications require both a minimum RON and a minimum MON. Most countries the quoted octane displayed is the RON, but in some countries the headline number is the average of the RON and the MON, sometimes called the Anti-Knock Index (AKI), Road Octane Number (RdON), Pump Octane Number (PON), or (R+M)/2. Because of the 8 to 10 point difference noted above, this means that the octane in some countries will be about 4 to 5 points lower than the same fuel elsewhere.